Addressing European transport ministers in Rome last week, Richard Deakin, the Chief Executive of UK air traffic services provider NATS, urged the European Commission to take a new approach to reforming the continent’s fragmented air traffic network. Deakin claimed the benefits of a Single European Sky (SES) – the programme designed to modernise air traffic management across Europe – had not yet been expressed in a way would encourage change and that 10 years of increasing regulation had not delivered the benefits that airline customers expect. “Regulation is not the only tool,” he said. “There are benefits from flexibility through commercial and industrial partnerships, through competition and through market liberalisation. “We believe that there has been a failure to clearly articulate the scale and impacts of the benefits [of SES] in a compelling way, as well as a rush to regulate” said Deakin, before adding that the advantages of a Single European Sky – namely lower costs and greater airspace efficiency – had never been explained with any clarity to its customers, the airlines. 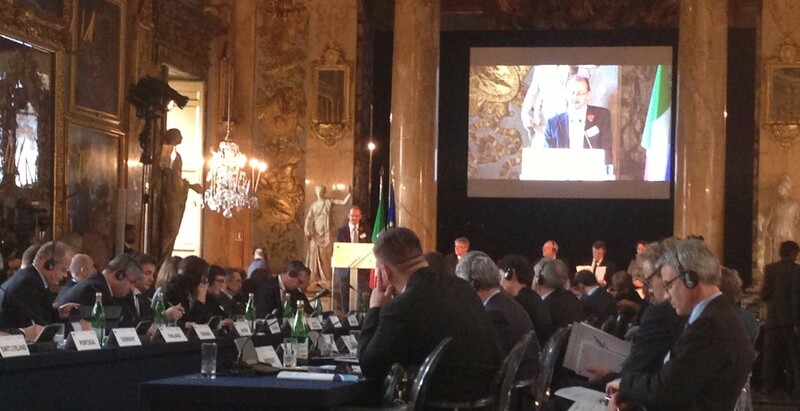 Richard Deakin addresses European transport ministers at the Pallazzo Colonna, Rome. Deakin also aired his frustration at a lack of uniformity among national regulators, each with its own standards that he said encouraged greater disparity and fragmentation. He concluded: “We urgently need to recognise that liberalisation and a market-based approach, where possible, will always deliver a better and faster result than regulation. Read Richard Deakin’s full speech.